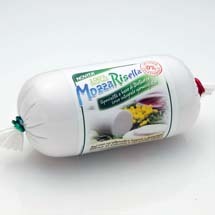 Mozzarisella a New 100% vegetarian/organic product. MozzaRisella is a delicious mix based on sprouted brown rice, 100% vegetable. It is a new organic, vegan product made without lactose, cholesterol, animal fats, gluten, preservatives, food colouring, soya and carrageenan. Like a cheese but not a cheese, great on pizzas and in salads. Sprouted brown rice contains many nutrients and fibre, which can play a key role in keeping you healthy. An ideal food as part of a healthy diet. An adaptable product with so many uses in food recipes. Milk and lactose free, without GMOs. Try Mozzarisella with any kind of food, by substituting normal cheese or mozzarella, or simply adding to them. Use MozzaRisella for creaming first courses. Taste it in salads, or give an original taste to your pizza or sushis. MozzaRisella is a healthy and digestible alternative, widely recommended to lactose and gluten sensitive people. Rice is the most used cereal in the world. In recent years much attention has been given to brown rice’s benefits to health, since it is a useful source of nutrients and bioactive compounds. Sprouted brown rice contains plenty of important nutrients, which play a key role in keeping you healthy. By adding sprouted rice to your diet, you help your body keep healthy, taking nutrients in natural doses in a well balanced way. MozzaRisella brown rice sprouts with the spring water flowing out from the heart of Lessinia Park at 600m. (Piccole Dolomiti).